When frequent travel is part of the job, the Passport Holder Neck Wallet by Voodoo Tactical offers a truly useful and secure solution to carrying a variety of essential travel items. The compact carrying case contains multiple open and zippered pockets to fit a passport along with tickets, IDs, maps, money and credit cards. 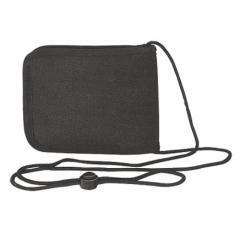 The wallet folds down the middle and guarantees item retention with the hook-and-loop closure. Voodoo's carrier can be worn over garments or tucked and concealed safely beneath a shirt. The neck cord adjusts for a custom, comfortable fit.